No, you do not need to create an account to shop with us. For a better shopping experience, a flat rate of $9.95 is applicable regardless of how Big or Small your order is. Orders are normally dispatched within 1 Business day and will arrive within 1-5 business days in Metropolitan areas (depending on state). Regional areas in all states may take longer. For custom orders, you will be notified either by phone or email on your estimated delivery time as times may vary depending on your requirements and quantity. Do you provide a Logo Embroidery service? Yes, we can definitely help you with branding your new uniforms. Click Here to find out more. Do you ship to PO BOX’s? Yes, we do, via Australia Post. At Top Chef Uniforms, customer satisfaction is our number one priority. Purchased the wrong size? Send it back and we’ll gladly replace it when you contact us within 7 days of delivery. This is all provided that all items are in there original condition. 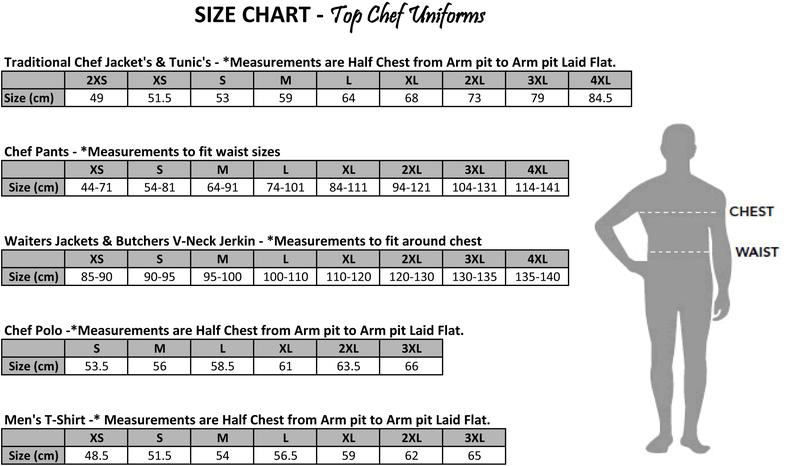 Top Chef Uniforms will not cover any postage costs for returns and exchanges, these are to be covered by the customer. Postage charges already paid by Top Chef Uniforms can not be refunded at the time of returning goods for refund. If ‘Free Shipping’ has been applied, Top Chef Uniforms will determine the actual cost of shipping charges and this amount can not be refunded. This does not apply to decorated (ie. embroidered/printed) garments. Yes, please refer to our Terms and Conditions Page.